The British Astronomers arrive, 1874. The British Man-of-war “Scout.”—On the evening of this Wednesday, this warship of the queen arrived with the expedition of the Group Observing the transit of Venus before the sun, after 36 days from Valparaiso. The reason for them not arriviving early as was planned was because the Observation Expedition did not arrive in Valparaiso before the date it was planned for them to leave there. 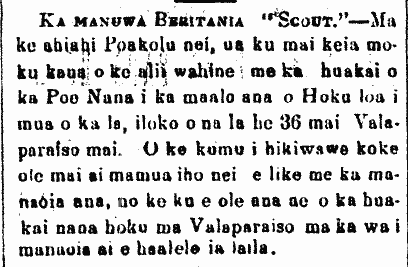 Ka Nupepa Kuokoa, Buke XIII, Helu 37, Aoao 3. Sepatemaba 12, 1874. More on Transit of Venus, 1874. The Day to Watch the Stars. The afternoon of this past Tuesday of this week, December 8th, was the day when Astronomers from times past and of these times believed that Venus [Hokuloa] would pass in front of the Sun, and it indeed did happen. The Sun came out that morning shinning nicely, and its rays continued to shine forth with clarity until the second when Hokuloa’s was seen beginning to peep over at the edge of the sun. The heavens were clear and the floating clouds were banished away, with just one seen, the thick, black cloud surrounding the heavens. Here are the places in Honolulu set aside by the people wanting to view the appearance of Hokuloa as it passed by: Honuakaha in Honolulu, the actual base of the Astronomers; the Government Surveying Office in the Government Building Aliiolani, for the Government Surveyor Laiana [C. J. Lyons]; the Labor Office, for David N. Flitner; Kapunahou [Punahou School], for the head of the Government Surveyors, W. D. Alekanedero [W. D. Alexander]; at Pawaa, for the Deputy Harbor Master of Honolulu, Captain Daniela [Daniel] Smith. And for the multitudes who just wanted a glimpse, they grabbed real telescopes and looked straight at the sun; and for those without telescopes, they grabbed shards of glass and placed them over candles until black, and then looked and could see. From the base of the British Astronomers at Honuakaha, it was very calm, there were no one allowed entrance, there was no talking, no whispering, and nothing that would cause excitement was desired; a battalion of soldiers was sent to the observation area to guard their peace. The Astronomer Boys put their all into their work for which they were sent by the government at great expense. Not one of them has any complaints about Hawaii for they were provided and blessed with a totally clear sky, and perhaps we would not be mistaken to say that these astronomers were very lucky for getting this good day for which they will not forget Hawaii. And by the kindness of the British Astronomers in Honolulu, we have these times below from various telescopes the Astronomers and others away from different places. The times seen by the last three were not taken into account by the Astronomers. However, there was not much difference between the times seen by the British Astronomers and our people keeping time. But it was surely a nice day for observing. The slides taken were not as great as was hoped for, but they are indeed of much value. Ka Nupepa Kuokoa, Buke XIII, Helu 50, Aoao 2. Dekemaba 12, 1874.